One of the most frequently asked questions that I get at the store is, "What are you reading right now?" There are people, legions of them, who can read five or six or ten books at one time and make sense of them all. I am not one of those people. I can handle three, maybe four, at one time. Otherwise names and dates and times all run together and I have no idea what I'm reading at all. I have devised a system in the past year or so that has helped me to organize my book life. I try to live that life with my feet in three worlds. One old book, one new book and one book that will come in the future. Booksellers, you see, are bombarded with advance reader copies of books that are not available to the general reading public. This is with the intention that when the books actually release there are booksellers talking to customers about them with some degree of knowledge. 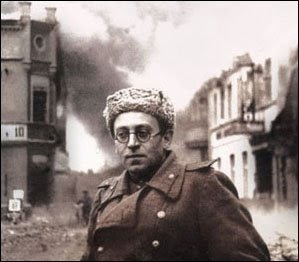 The old: "A Writer at War: A Soviet Journalist With the Red Army , 1941-1945" by Vasily Grossman. Grossman was a novelist and essay writer who volunteered himself as a journalist in the great fight. I first knew of him through his massive novel, "Life and Fate." His war journalism has been compared to Ernie Pyle, A.J. Liebling and John Hersey. Needless to say, it is informative stuff. The new: "Lush Life" by Richard Price. This isn't exactly new. It came out last spring and the paperback is due in March. Price is the literary master of the who-dun-it. His prose and conversation are second to none. I'm, somewhat ashamedly, a huge fan of the HBO series The Wire and all of its best assets present themselves in Price's prose--who wrote for the show. The future: Anne Michaels is known to the cult fans of her last book, "Fugitve Pieces." It's been about ten years and her newest does not disappoint. Taking place in both Egypt and Canada the story unfolds with a pretty slow pace--but well worth it. The words, each and every single word, are well chosen and placed. I'm only 3/4's done but I read it at every chance I get. It is, without doubt, something to look forward to in the world of fiction.